Fancy yourself a flapper? Want to get 'dress up like a million dollar trouper'? Busting to show off your Black Bottom? Charleston like Clara Bow and drink champagne like Gatsby? Well come and join the party. 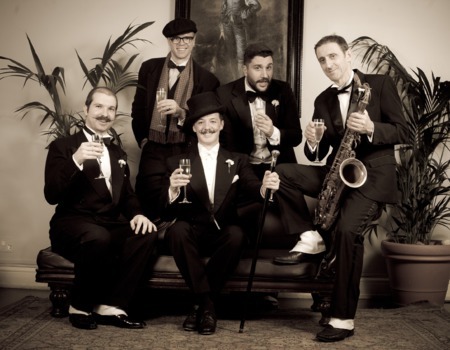 Champagne Charlie and The Bubbly Boys are here to keep the roaring 20, roaring! A crack team of handsome sharply dressed musicians that will give you the thrilling live sound of the jazz age, the time of Art Deco and the speakeasy, playing hot tunes at 78rpm. Now that's fast! With music from Gershwin, Porter, Berlin to name but a few. Songs like, Puttin' On The Ritz, Running Wild, Sweet Georgia Brown and our famous 12 minute Charleston dance-off-mega-mix! Can you last? Whether you know the steps or just want to jig about to the charm of this timeless music we know you'll find it as infectious as we do. Let yourself go with wild, raucous gay abandon! There is plenty for everyone with audience participation, a tap dance from Charlie, sing-a-longs, surprise costumes and of course, plenty of time for you to dance. Charlie will get thing off to a real swing and you will be screaming for more 'CHAMPAGNE' long after the party is over.